As a woman, and mother to three wonderful children, I have experienced disappointments and joys during birth. Having experiences that left me feeling powerless and alone and then one that was so joyous I wish I could relive it over and over again. It is the joyous birth experiences that I want to help other women achieve. I provided support to the mother, father, and any friend or family members attending the birth. It is my goal for everyone involved to walk away from each birth with beautiful, lasting memories. I believe that every woman is entitled to a peaceful birth in which she can relax and feel confident in the care she will be given. Knowing her beliefs and values will not be inflicted upon, but instead will be carefully guarded and respected during the memorable event in her life. It is my belief that giving birth is a sacred rite of passage. Every woman should be able to do it her own way. We all know that certain things are completely out of our control when we are giving birth. But then there are those things that we can take hold of and manipulate to our advantage. It is those things that are very important to focus on — the things that we can control and want to control. I believe that a woman who is in active labor should never feel like her rights have been taken away from her because she is too busy working hard to bring her child into this world. I will do everything in my power to give the type of support that will help prevent these things from happening. Each birth I attend is a remarkable gift and I am humbled that it has been given to me. Your needs and your beliefs are my priority. Lending library; prenatal massage; relaxation/visualization help; massage during labor; VBAC support; Bellycasting and painting. 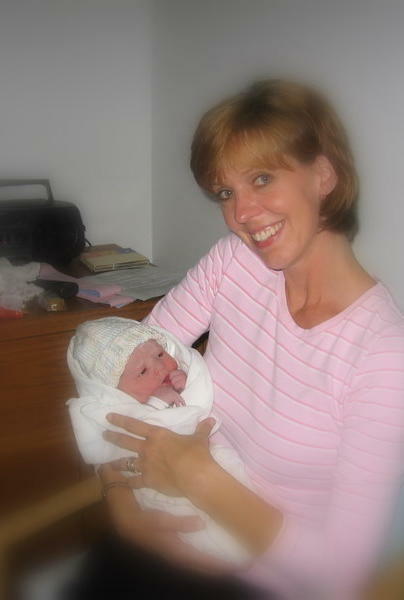 I completed DONA Doula training in April of 2005 and a Birth Training Course at Madison Birth Center in March of 2005. I am currently persuing Hypnobirth training. I learn from each birth that I am blessed to attend. There are no two the same. I am proud to be a Small Miracles Volunteer Birth Doula. Self, three (one cesarean and two VBACs); as doula, 33. Tammy can be reached at 608-837-7826 or 608-220-8836 or empoweringbirths1@yahoo.com.